Two days before the event @xavierdisley warned Wiggins that due to the weather forecast he will lose 500 meters. At that point Wiggins is still full of confidence and is ready to break the 55 km mark in a fully packed velodrome in London. A pretty figure of Xavier, to bad it is missing some information on the datapoints used to generate it. Two days after the event, the figure popped up in different news articles and post-race videos like the great one of GCN: Bradley Wiggins Breaks The Hour Record! Essential Things To Know About Brad’s Record-Breaking Ride. 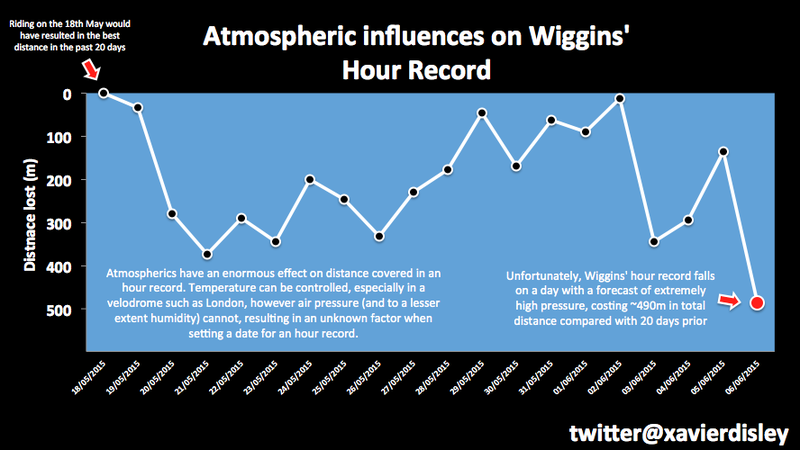 Effect of weather patterns on #UCIHourRecord – @OfficialWIGGINS giving up distance compared to 20 days prior #MyHour. So what is this magical atmospheric pressure? And can you calculate the effect of it yourself? Based on scientific publications (Grappe et al. 1997, Kyle and Burke 1984) it is safe to assume that if one rides faster than 54 km/h drag contributes to more than 90% of all resistance. Other forces slowing Bradley down are for example the rolling resistance of the wheels, internal losses in the chain and going uphill in the corners. But in the end it is drag that is the main force he had to fight during his one hour attempt. Well, let’s take a look to Bradley. One of the most impressing things of his attempt was his beautiful time trial position which didn’t change through the entire ride. 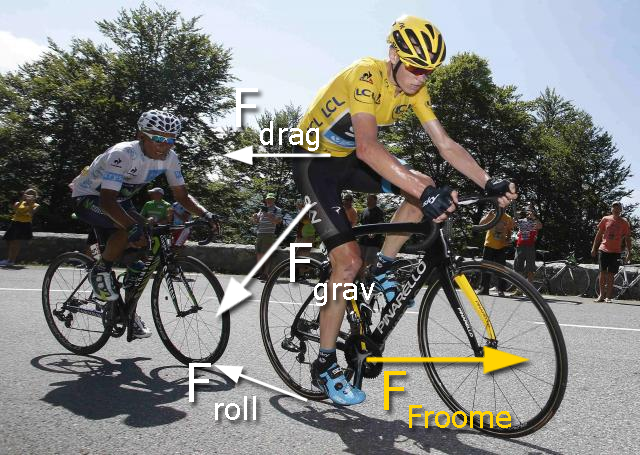 So it is safe to assume that the part of the equation that describes his frontal area ( ) and drag coefficient ( ) stayed constant and we don’t have to focus on this part of the equation. So it all comes to the air density . In the formula you can also see that temperature has in inverse relation on the air density. So maybe a few extra spectators and spots that generate heat would benefit him? If fatigue due to the heat doesn’t get to him first. But that’s not all. One could go a step further and also include the effects altitude on the air density. Should Wiggo do like Merckx and recently Dekker, and go to Mexico to have the benefits of the altitude and thus a lower atmospheric pressure? with h the height in meters above sea level. The recorded temperature during the event was about 30°C and at the point of the event a high pressure field was present in London (103500 Pa). Based on this and the altitude of london (35 m above sea level) one can estimate the air densities at the time of the attempt. Using different properties one can use Eq. 2 to calculate a theoretical avarage speed in that condition. 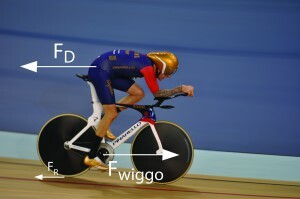 The advantage of this way of calculation is that the drag properties of Wiggo were eliminated and thus uncertainties in the calculation are removed. This calculation shows that Wiggins would almost reached the 55km mark if there was a low air pressure field over London at the time of his attempt. However, the effect of altitude has a larger impact on his performance. So I would suggest him to try the track which Merckx used for his record in 1972 and smash that Boardman record. The theoretical value calculated above should be approached with care, it does not take into account the lower oxygen levels at higher altitudes which can influence the power a rider can deliver for one hour. Due to the lack of personal data of Wiggins (weight, drag properties, power curve) estimates on the second order effects will probably have the same error as the simplified ‘back of the envelope’ calculations’ above. And if Wiggins doesn’t like travelling that far, the velodrome of BMC in Grenchen, Switzerland, at an altitude of 451 meters above sea level would allow him to come close the record of Boardman (56.375 km) on a low pressure (101325 Pa) day by only 400m short. So if he works on his loss in performance in the last 10 minutes he can try it. But keep your velodrome hot and packed with spectators, because a drop in temperature will result in more drag! After some discussion on Twitter someone pointed me to this good article on the reduction of power at higher altitudes: http://alex-cycle.blogspot.com.au/2014/12/wm2-altitude-and-hour-record-part-ii.html Nice references too. Sounds like we know what Alex Dowsett has to do to beat Wiggins…head to Switzerland/Mexico on a low pressure day.